On 26th August 26 Bibiche Di Barbochos Reiau de Prouvenco earned Working Certificate Intermediate. 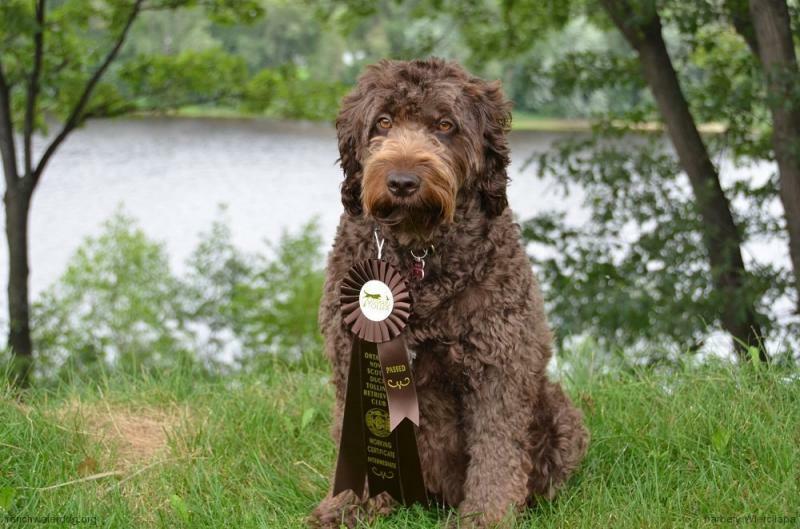 She is the first Barbet in Quebec and Canada to succeed in this test. “La preuve est fait à tous que notre Barbet est un excellent rapporteur”. More about hunting with Barbets on Jacques’ websiteBarbochos 3Rivieres.com/ Read below to see what dog needs to do to earn the title. all eligible breeds who have earned the title ofWC. useful partner on a hunt. deliver to hand, and shall come to the line off lead. meters (25 yards) of the judges. moderate to moderately heavy cover. until the test is ready to resume. yards) from the line. One bird shall land in cover. located between the 2 marks and visible from the line. 9.2.7 WCI dogs are not required to handle on a mark. covered.Guns and blank ammunition are to be used.